Defining a model of language evolution that is neutral at the level of linguistic variants requires an account of learning that is explicit about the inductive biases of learners–those factors that make some variants easier to learn than others–so that it is clear that these biases do not favour particular variants. We model learning as statistical inference, with learners using Bayes’ rule to combine the clues provided by a set of utterances with inductive biases expressed through a prior distribution over languages. We define a neutral model by using a prior that assigns equal probability to different variants of a linguistic form. While it is neutral at the level of variants, this approach allows for the possibility that learners have more general expectations about the structure of a language–such as the amount of probabilistic variation in the language, and the tendency for new variants to arise–that can result in forces analogous to directed mutation at the level of entire languages. So, if this is the case, we can instead appeal to high-level inductive biases as explanatory mechanisms for the structure of languages, without necessarily appealing to selective forces at the level of linguistic variants. 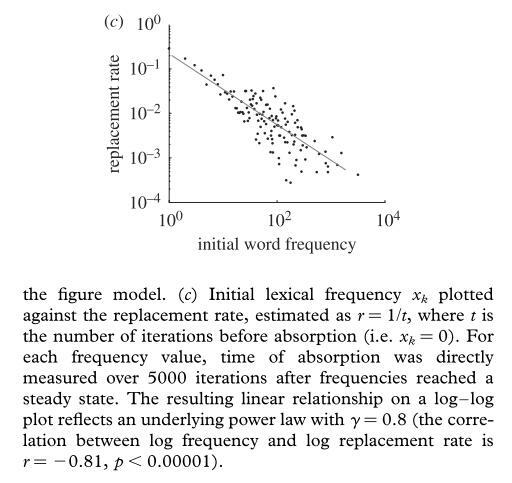 By combining the Iterated Learning Model (ILM) with Bayesian learners, the authors arrive at two surprising conclusions: (1) the model is equivalent to the Wright-Fisher model of allele transmission; and, (2) the model is able to reproduce basic regularities in the structure and evolution of languages without the need for the selection or directed mutation of linguistic variants. To reach this equivalence with the Wright-Fisher model linguistic variants are treated as different alleles of a gene, with the Markov chain produced by Iterated Learning matching the model of genetic drift. Essentially, they are proposing the results from population genetics can help define the dynamics and stationary distribution of the Markov chain: this will give a good indication of what kind languages will emerge. Following an argument similar to that for the finite case, iterated learning with Bayesian learners considering distributions over an unbounded vocabulary can be show to be equivalent to the Wright-Fisher model for infinitely many alleles (see the electronic supplementary material for a detailed proof). Their model is neutral in regards to both selection and directed mutation at the level of linguistic variants, assuming a symmetric mutation between competing variants. The goal is to provide a null hypothesis to evaluate certain claims about the importance of selective pressures, which are often used to explain the “statistical regularities found in the form and evolution of languages”. As you’ve probably guessed, the authors find that their null model can account for three linguistic phenomena previously mentioned. I’m going to focus on lexical replacement rates because it’s what I’m most familiar with. Anyway, two recent studies show how the frequency of use predicts: (1) the rates at which verbs change from irregular to regular forms (Lieberman et al., 2007); and, (2) the word replacement rates in Indo-European languages (Pagel et al., 2007). So, if a word is used frequently, then it is replaced much more slowly than a less frequently used one. For instance, Pagel et al found that over a 10,000 year time scale, some words show a minimal amount of cognate replacement (zero to one) for words used frequently, while less-frequently used words might have up to nine cognate replacements. Furthermore, certain classes of words evolve at different rates, with prepositions and conjunctions changing more quickly than pronouns and numbers. When plotted, this shows an inverse relationship between the frequency of use and replacement rates. In the infinite case, mutation occurs only to new variants, thus, all variants are eventually lost from the population. A new cognate is represented by a new variant. Replacement happens when the variant corresponding to the old cognate becomes extinct. The case of verb regularization is modelled by assuming that irregular and regular verbs coexist as two variants among other words in the vocabulary. Extinction of the irregular verb happens when the regular form replaces completely the irregular one. While this analysis of one of the most basic aspects of language–the frequencies of different variants–emphasizes the connections between biological and cultural evolution, it also illustrates that the models developed in population genetics cover only one small part of the process of cultural evolution. We anticipate that developing neutral models that apply to the transmission of more richly structured aspects of language will require a deeper understanding of the mechanisms of cultural transmission–in this case, language learning. N.B. You can currently download this article, and the whole backlog of Royal Society articles, for free until the end of July.